Prior to the Sundance announcements, there was a bit of buzz around Brian Horiuchi's Parts Per Billion's as a favourite for selection but when the titles were announced last week, Horiuchi's directorial debut wasn't listed, despite the interesting premise and the great cast. 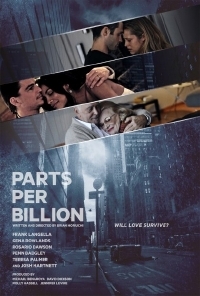 Frank Langella, Gena Rowlands, Josh Hartnett, Rosario Dawson, Penn Badgley, Teresa Palmer and Alexis Bledel all star in what appears to be a trio of intersecting stories that unfold against the backdrop of a biological war which is killing millions. I can't tell if the trailer which has emerged is what we can expect from the movie, it has a very dream-like quality in the colors, but I love this cast and the concept of people dealing with the drama of their lives as the world collapses around them.